What if that energy field was a gateway to the entire universe? It's called the MerKaBa and it is your personal vehicle of consciousness. In the coming generations, mankind will discover that the MerKaBa is actually a multidimensional lightship that can take your awareness anywhere in the universe. 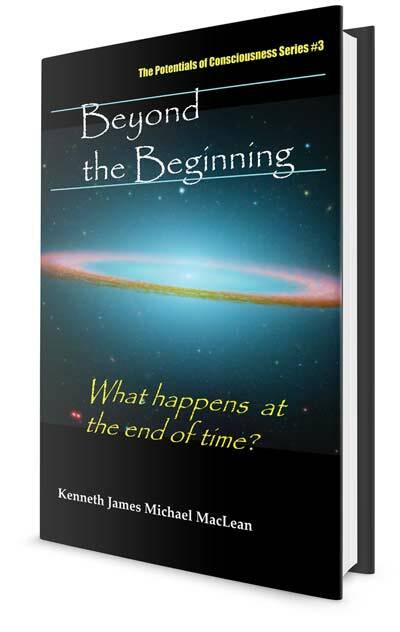 Beyond the Beginning is about this discovery and the potentials of consciousness. Earth –– an isolated planet in the Desert, off all galactic trade and communication routes. Earth –– an ancient planet, teeming with life in astonishing diversity, yet hidden within a nondescript solar system with a single commonplace star, a yellow dwarf, G2V on the Main Sequence. Deep within the fabric of the cosmos, the completion of a 15 billion year cycle is imminent. Even within the illustrious civilization of the Twelve Galaxies, only a few of the greatest minds even suspect such a thing. Soon, all eyes will turn toward earth, for it will be a primary player in the universal drama that is, even as you read these words, now unfolding. The Mer-ka-ba is the interdimensional vehicle depicted by Egyptian and other Eastern religions. It has also been described (some say) by Ezekiel, in the Bible. This craft, which is an incredibly sophisticated template of dynamically interacting fields of light, is capable of carrying consciousness to higher dimensions. Like a sophisticated aircraft, the sphere of consciousness can be activated. Within it are complex geometries of subtle energy, each performing a specific function. When these geometries are understood and activated, the human spirit is freed from the confines of the body and an entire universe of experience opens up. On the widest possible canvas, Beyond the Beginning answers the questions "What is the relationship of consciousness to the physical universe?" "What is God?" in a surprising, inspiring, and thought provoking manner. This eBook can be downloaded at my website, Amazon.com, or on your favorite digital platform.